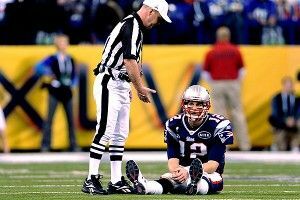 I’m sure Tom Brady is going to take a ton of solace from the fact that the image of him sitting on the Lucas Oil turf, in a state of total dejection and disappointment, has become an Internet meme, which people in offices, outside of elevators, and pretty much everywhere else you can imagine (as well as a few spots you’d rather not) are replicating. Don’t worry, Tom. Eli Manning might be going to Disney World. But you’re going to Tumblr. Check out all the shots of Bradying here.